A petition asking the world’s largest fast-food chain to carry a meatless burger is gaining traction following its competitor’s successful trial of the “Impossible” burger. And — according to those who have eaten one — this meat replacement doesn’t actually taste like cardboard. To some, there’s nothing more satisfying than sinking their teeth into a juicy beef burger. But the cattle industry is a large contributor to global-warming greenhouse gases — thanks to the carbon dioxide produced by cows, and the cutting down of forests, which soak up CO2, to make more room for grass-eating steers. Other approaches to to lessening the environmental impact of humanity’s obsession with beef involve changing the diet of cattle and sucking up the CO2 in air treatment plants. Attacking the problem on the consumer level, the recently introduced Impossible burger is the latest in a long line of meat substitutes. What’s new is the claim that instead of having to sacrifice taste for your principles, as with the vegan burgers of old, these new meatless burgers are tasty. Burger King cleverly launched its meatless “Impossible” burger at 59 restaurants around St. Louis, MO, on April 1 — and according to those who have tried it, this breakthrough is no joke. The reactions from lifelong beef fans are priceless. As you can see in one of the videos below, they turn the air bleeping blue with their incredulity at the reveal that the burgers they just chomped aren’t 100 percent cow. So. If it is and yet isn’t meat, just what in tarnation is it? And how is it tricking all these meat lovers into loving it like meat? It’s all down to science. This meat substitute relies heavily on genetic modification — a phrase Impossible’s website doesn’t use, presumably to avert the negative reactions that usually follow. But while the company is trying to bury the actual science, it is extremely proud of the ingenuity its scientists employ to make veggies taste like burgers. 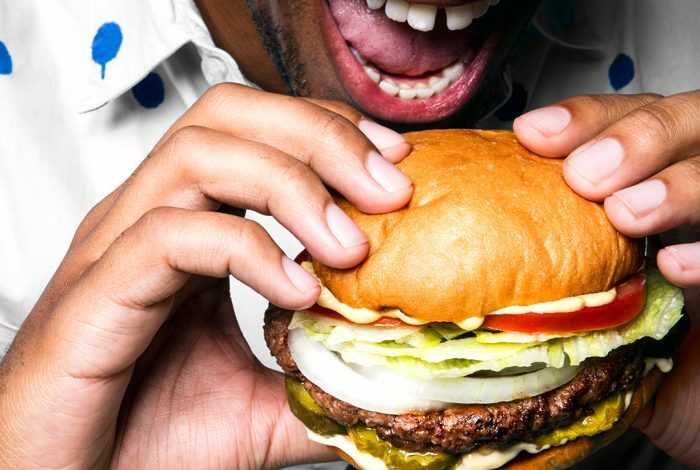 A protein called heme gives meat its taste, and Impossible has managed to replicate heme on an industrial scale to give its veggie burger that meaty taste. Root nodules of leguminous plants like soy contain leghemoglobin of which heme is a main component. But the quantity of nodules needed to replicate the flavor of beef had been prohibitive, so the food scientists at Impossible created heme through fermenting yeast. “It’s a far more scalable and sustainable way of making that protein,” says principal scientist Smita Shankar. The patty used in the Burger King version models itself on the popular meat-to-fat ratio of 80/20 — only the fat is coconut oil, and the meat is, well, not there. The videos this week are a quick explainer on the tasty franken-protein heme, a more in-depth look at the process Impossible uses to make its un-meat, and carnivores’ reactions to eating said plant-based burgers. Related front page panorama photo credit: Adapted by WhoWhatWhy from Impossible Foods.